We’re a little late on the update, but we wanted to write to everyone to say: we’re thrilled, excited for the future, proud and so thoroughly thankful for everyone who has helped us get to this point. We wanted to write a blog to reflect on the last two years, celebrate our successes and share a little of our plan for the future. Ours is an incredibly diverse and fast-moving space. We’ve learned a lot along the way and we’re sure there will be big changes in the future. For those reasons and more, it’s important to stop and celebrate how far we’ve come and where we hope to be. Dignity was born out of an almost desperate desire to fix a backyard yet previously hidden social issue. Some might say that Period Poverty is most confronting because of its prevalence mixed with its proximity – most mensturators can think of a time when they were caught short, or couldn’t afford sanitary items, or had to awkwardly ask around if anyone had spares. It’s never a fun experience. When the above article was published, it was the moment that the need for something like Dignity within NZ hit home for us. How was this an issue and nobody was talking about it? How could we help? Jacinta and Miranda worked throughout the summer Bootcamp to develop a solution to a problem that hit so incredibly close to home for people throughout all of NZ and the end result was Dignity NZ. Judging from the last two years, we feel sure it almost couldn’t have come at a better time (except perhaps earlier). We’ve come a long way from the days of the Vic Bootcamp but none of it would have been possible with our amazing partners who signed on and saw the same vision that we did. We saw an initial struggle to finalise partners which were a quick learning curve for us. The first six months were a test of our strength and dedication, but we stuck to it and look where we are now. We couldn’t have done it without our incredible partners who’ve joined us along the way, so thank you to the following partners: Xero, Flick Electric Co., St John, ANZ, Cigna, Ākina, Chapman Tripp, Dentsu and NZ Post! Dignity is an ethical, sustainability-focused business! We’re not only focused on tackling Period Poverty, although that is our core focus; we are also focused on making sure that our impact is not being minimized through a poor sustainability and ethical practices. With that in mind, we’re officially a zero-emissions business who pay at the living wage! It’s a pretty big thing for such a small company (4 part-time employees) to be able to say that it’s zero emission but we wanted to reflect our belief that in offsetting one issue, we shouldn’t contribute to another. So how to do we this? It’s definitely tricky to find shipping resources in NZ that don’t use fossil fuels to some degree, to make sure that we’re making amends for this, we counter the eco-footprint run by our couriers by planting trees for every kilometre travelled. 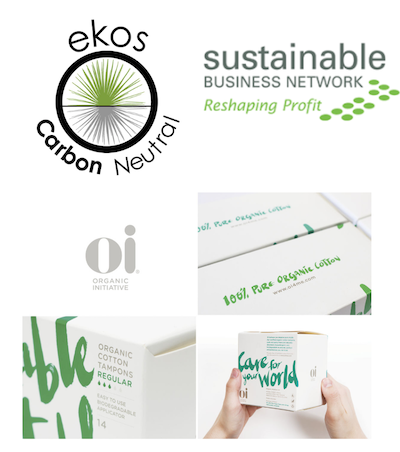 We also partner with The Organic Initiative who’s 100% organic certified cotton sanitary products are beautifully made but are also biodegradable, non-synthetic, hypoallergenic, and chemical free. Read the whole list here, but we’re confident they fit the bill when it comes to supplying sustainable options to suit all menstruators. Not only are their cotton products top of the line, but so are their menstrual cups which we have been proudly stocking since October of this year. Read Sophie’s blog on cup use if you have any questions or queries on how they may work for you. Finally, we pay the living wage! That means that every one of our staff members (officially 4 part-time which means we’ve doubled our company size in the last year) is paid a living wage, this means that we are confident that our valuable team is able to use their wages for the necessities that life demands, and that they feel valued for the wonderful work that they contribute Dignity NZ. Our successes can be measured. To date, we’ve given away 11, 086 boxes to menstruators throughout NZ over the last 2 years. In that time we’ve also grown to support 50 NZ high schools, and added menstrual cups to our corporate products. To put it simply, 2018 Has been a huge year for us. Increased our impact by 6 times what it was last year. And we don’t plan on stopping here! This is just the tip of the iceberg for Dignity NZ. 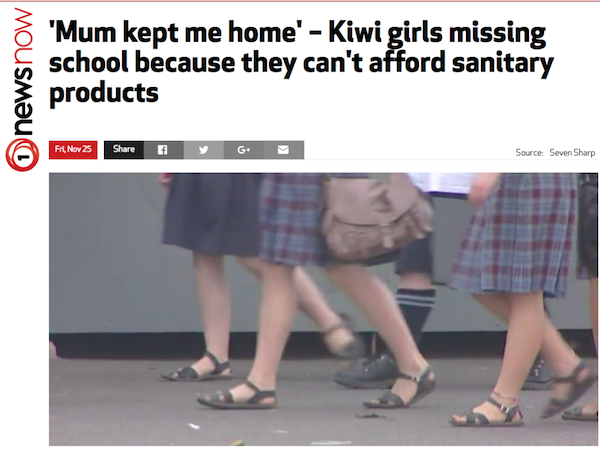 We would love to see more and more conversation initiated, education becoming as prevalent as this conversation and, of course, free sanitary items for all menstruators throughout New Zealand. Period Poverty is a wicked problem – It’s convoluted, complicated, multi-faceted and difficult to address but there’s no better way to start a movement than with a conversation. 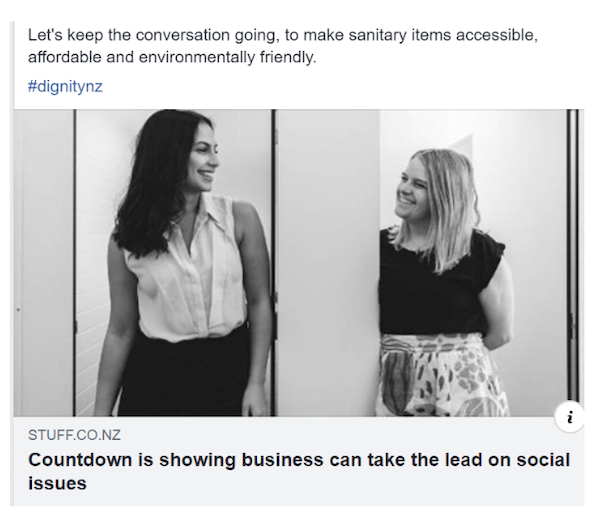 Next year, Dignity will be working with other period poverty initiatives to create a national conversation to try and facilitate future solutions to period poverty in New Zealand. We are also going to be supporting others impacted by period poverty, not just students – that’s all the details we can give you for now, but watch this space! From the team at Dignity, thank you for your support! We can’t wait to see what the coming year brings.